on the cover of his illustrated edition of "Metropolis"
One of the acknowledged masters of comic book illustration, Mike Kaluta has proven himself a multi-talented graphic artist who has transcended the limitations of the work which first made him famous. His glorious re-creation and embellishment of pulp magazine illustrations in his highly acclaimed "The Shadow" published by DC Comics remains a high mark in 20th Century pop art. His less streamlined and more mechanized approach to the robot and his nods to pulp fiction motifs take the Art Deco world of "Metropolis" and show it at a new angle which must in turn have an influence on the design choices made for the Pentacle Theatre production of the musical. 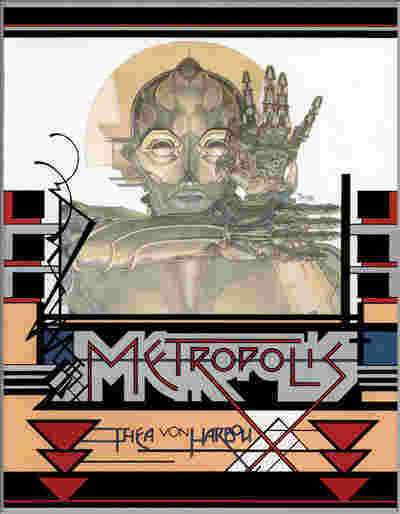 Step in to the beautiful illustration from "Metropolis" below to see an online portfolio which includes every piece Kaluta did for the trade paperback edition of Thea Von Harbou's novel. Text from the book is under each illustration, so a good feel for the unusual surreal landscape of the novel can also be grasped. Exploring the site further and you'll discover many examples of Kaluta's diverse artwork. As in the film, the characters of "Metropolis" have Germanic names. They have been Anglicized in the musical version. To help clarify who is who when comparisons are made between these different versions, here is a list of the main characters, with the original names on the left, and their corresponding names in the musical at the right. Maria and Grot remain the same. Josaphat from the film is not a character in the musical, but other new characters appear, most notably, some of the workers are supporting roles as are a group of children. click to see all of his artwork for "Metropolis"